Oh, there wasn’t no reason. no. And if there’s something you’d like to do. Oh, just let me continue to blame you. When I started putting this visual together my original vision was different. My first thoughts were to go with a gory visual but as I kept thinking about it I wanted to make it more about the mental aspect of the scene. You can add blood to anything and just leave it at that but I wanted a little more that would be more about the logical aspect. There are some elements based off the book/film “The Shining” as the backdrop that I am using is based off of it as well. With my look I wanted to give the feeling as if the person in question had not shaven or cut their hair as well as suffer from insomnia and or paranoia; this person has completely shut themselves off from the world. Putting this together was a lot of fun even if my vision changed a little once I started to put all the pieces together; I think that what I did finish off with came out better in the long run. I feel that my song choice also fit perfectly and allowed me to dig into a rarity by Pearl Jam that not many knew about before their “Lost Dogs” unreleased tracks album came out. I first encountered this song when I purchased a cd single of “Jeremy” (this is when that was a big thing to do to get songs not put on albums). Listening to it carefully it gives me the feeling that it is about someone who is suffering from some kind of depression or mental illness; it could even be dealing with the loss of someone and the aftermath of it. Lately I can not say enough about the new hairs being released by Modulus. The brand may be a partner of this blog but as a reviewer of items I have a duty to be honest with the products I feature on this site. I’m not here to blow smoke up anyone’s rear end or praise someone because I know them or are friends with them. I genuinely love this brand and have from it’s beginnings as a skin store by the name of Fruk. 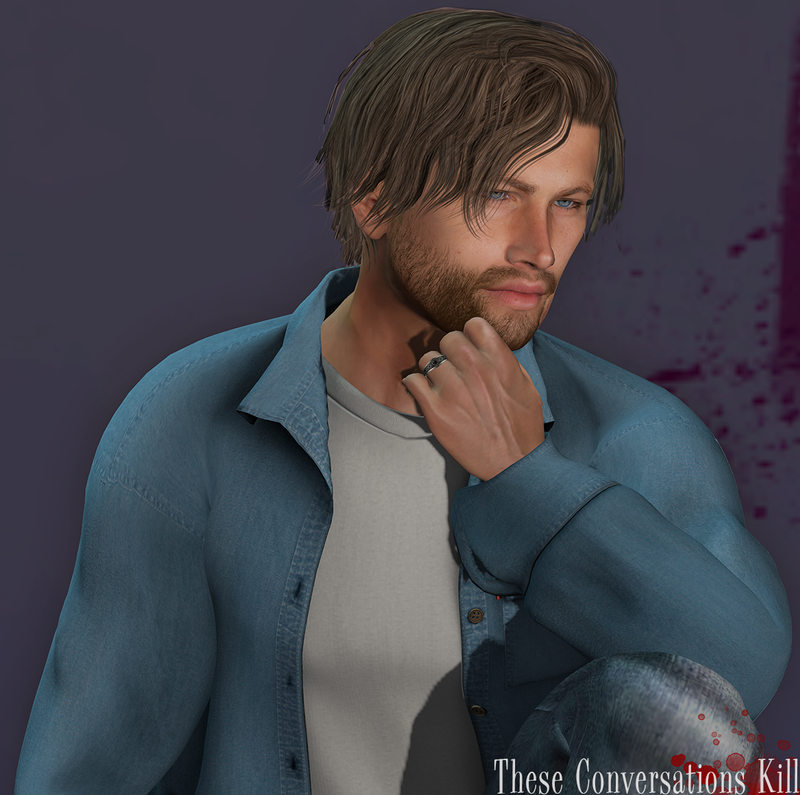 Fast Forward to present day and the hairs that are part of the Alpha series, they are not only styled well but have great textures and design. Many brands are fighting for your money which obviously you know. I do have access to Modulus and the brands creator, Chucky Hollak, and I can tell you that I have never met anyone so dedicated to making products that you will enjoy and use over and over. If it isn’t up to his strict specifications then it doesn’t see the light of day and that tells me something. This brand does not phone it in. Lately I have had some fruitful shopping trips, one of which was to the recently opened Man Cave. After two trips leaving with things I feel like I could even go back again for more but I have to keep in mind that Men Only Monthly just started as well as Hipster Men’s Event which is coming up this Tuesday. Times like this with so many things I feel that I can use in my photos it makes budgeting a pain in the backside. My love of shopping is not a very good thing for my wallet. Time for me to finish up here and get to those credits and my opinions on the items I have not previously blogged before and work on what is to come. For the second straight month in a row, The Men’s Jail has been fortunate to have Modulus release a new hair at their event and I have it on good authority that the “Adam” hair has been styled after the man behind the character Kylo Ren, Adam Driver. Mid length to longer styles are always catching my eye because it allows me to have the kind of hair that I do not have in the real world. This great style is available in 5 color packs (each with 5 colors) and can be purchased as a FATPACK as well for the people who just can’t decide and want to save themselves some hard earn money. Previously released at the first Cosmopolitan event that ran from January 1st-15th, these eyes are every bit of what you have come to expect from Avi-Glam. For this blog I am wearing the Sky color eyes. In addition to that color there are 19 other colors you can pick from or if you absolutely cannot live without more than one color you can get them all for a value price. Included is a HUD for CATWA, Omega and Regular (which work with the mesh eyes also in the pack). Beards are something I like quite a bit and in varying styles depending on my mood. This beard is a bit thicker than a lot of the other styles I have worn (though I have been known to sport some really heavy beards). There are several versions included in this pack and have HUDs for both CATWA and Omega. One of the styles allows for you to have a salt and pepper style beard if you want to look a little more seasoned as some do here on the grid. When I first saw this product I had to have it and I could not just purchase one and went with the FATPACK. The best part about doing that is that there are extras included that you cannot get if you buy separately. I am wearing the blue flannel with white shirt combo even though I love the pack has plaid flannel in it as well. There is HUD for both the flannel and also the inside shirt (which would also be in single packs). If want to wear the flannel open without the shirt there is a toggle in the HUD where you can remove it or add it back on whenever you want. Wallet chains may not be the in thing as much these days as they have in the past but it’s a feature I love seeing in jeans which is why this product was a must have. Gabriel makes not only quality products but makes them super affordable even for their FATPACKS which I splurged on with this as well and as I said, I did do a bit of damage at Man Cave as you are now discovering. There are three colors of denim (dark, light and black) with the wallet chain as an attachment. Even if the wallet chain is not your cup of tea, you can always get these jeans and not wear it because they are still great with or without the addition; if you decide not to jump on these you may just regret it at some point and that’s just my opinion. 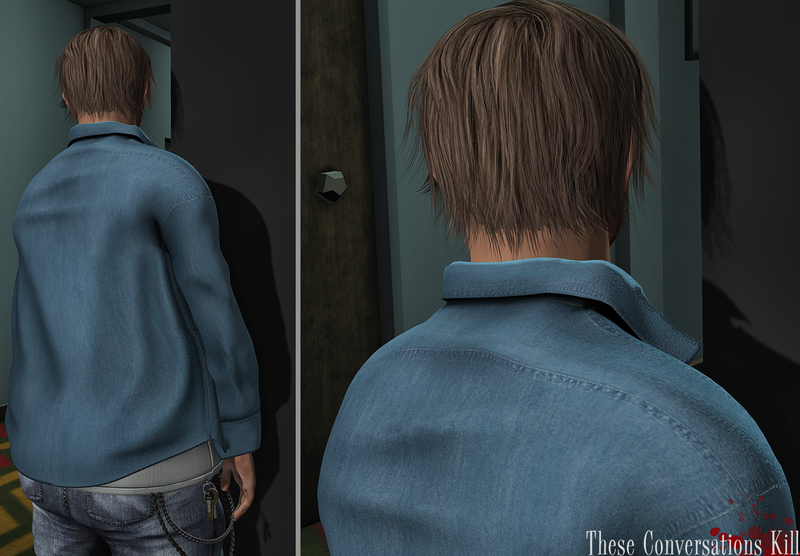 ℭ𝔬𝔪𝔭𝔞𝔱𝔦𝔟𝔩𝔢 𝔚𝔦𝔱𝔥: Belleza, Signature and SLink male bodies. There’s definitely more than one reason for the Man Cave event’s name. Not only is it making a reference to being a male only event as well a room in a house where males hole themselves up in on the weekends or during possible sporting events. Personally I think it also refers to one’s ability to not pass up a great item and they “cave” under the pressure to buy things like FATPACKs. EQUAL is a newer brand out on the scene but having come across their brand in several events in the last few months I am becoming a fan with the quality and styles they are releasing. The style of these shoes really caught my eye and there were so many great colors that when I priced the ones I wanted and looked at what it would be for them all it was a no brainer. The HUD that is included with the FATPACK allows you to customize sections of the shoe with all the available colors in the pack and there are a total of 10. Inspired by the hotel featured in “The Shining” I have seen some really cool movie scene recreations and I wanted to do something just a little different from all that I have seen and I feel I hit the nail on it. The build is put together very well and photographs great as I tested several different windlights while I was trying to find the right mood for the session (which I used two different ones). When it comes to building backdrops, Bad Unicorn is one of the tops in that genre and I always look forward to seeing their work at events and new store releases.